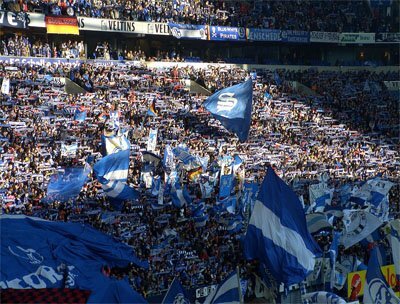 For a club as rich in history and popularity as FC Schalke 04, it can be somewhat dispiriting not to have a single Bundesliga title. Still, their trophy room is certainly impressive enough: seven national titles, five DFB-Pokals and one UEFA Cup. The team fans waving their blue and white flags. After twenty years of existence and a couple of failed mergers and name changes, the club took the name Schalke 04 in 1924, with the "04" in the title standing for the year of their foundation. Along with the name change came the new blue-and-white jerseys, which were the basis for the club's most famous nickname: the Royal Blues. The 30s were a time of major restructuring in top-flight German football, which lead to the forming of sixteen regional divisions known as Gauligen. Schalke were placed in the Gauliga Westfalen, and from the very start proved themselves a force to be reckoned with. They won the title in each of the league's eleven seasons, qualifying for the German championship play-offs in the process. The club continued to live out its golden years by winning six national titles and one DFB-Pokal in the period from 1934 from 1942. And though the post-war period had seen them fall off the map a bit, they remained a strong contender. Schalke won its final national title in 1958, five years before the foundation of the Bundesliga. After many decades of uneven results, including a couple of relegations, Schalke managed to win their first and only European trophy by defeating Internazionale on penalties in the 1997 UEFA Cup finals. This triumph signaled the beginning of a new, modern era for Schalke, and the club followed it up by winning two consecutive DFB-Pokals in 2001 and 2002. The turn of the century also saw them come incredibly close to winning their first Bundesliga, losing the title in the 4th minute of injury time. The 2011 season was also notable for the club. In addition to winning its fifth DFB-Pokal, Schalke made the semi-finals of the Champions League, where they eventually lost to Manchester United with an aggregate score of 6-1. The logo of Schalke 04 is typical for German football clubs in its simplistic design and the initials as the single feature. The “S04” in the blue ring obviously stands for Schalke 04. The logo has been almost consistent through the club's history. 2010-11 Semi-finals Eliminated by Man U.